One of first steps in the development of solar energy projects is a pre-feasibility study. A key requirement is to make decisions on basis of reliable data, with limited time and resources. In 2010, Solargis launched prospecting tools - iMaps and pvPlanner - with the goal of providing fast access to reliable energy yield estimates. The tools became very popular amongst solar professionals - as they offered both simplicity and reliability. Over time we analysed the user feedback. Since last year we have been working on rebuilding our prospecting tools from scratch, so that we can make solar pre-feasibility more complete and even more reliable. We are happy to announce the launch of Solargis Prospect - a new prospecting tool that replaces iMaps and pvPlanner. This update introduces a number of new software features, updated solar, meteo and terrain database, and also improved PV simulation model. Most importantly, this update provides a foundation for development of next series of Solargis apps: Evaluate, Monitor, and Forecast. Our vision is to offer a suite of integrated apps that help with solar energy evaluation across the entire project lifecycle - from conception to operation. Below is a summary of new features available via Solargis Prospect. 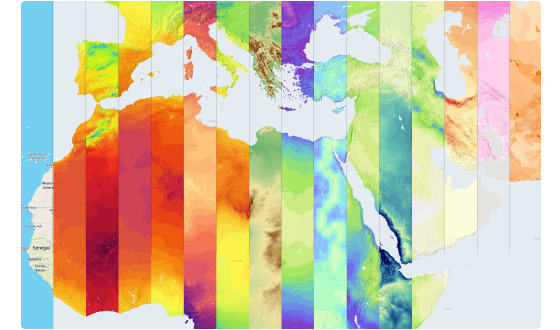 The solar resource and meteo data has been re-calculated using the latest version of Solargis models. The updated data represent time period up to 31 Dec 2018. Previously, the data represented period up to 31 Dec 2015. In addition to monthly averages, key data parameters, such as PVOUT, GHI, DNI, TEMP, are now also available as 12 x 24 (12 months x 24 hours) average profiles. Such information is particularly useful when value of solar electricity varies by time of day - for example when maximising yield at particular time of the day is more important that maximizing the annual yield. We are introducing new data parameters to make it easier to understand impact of environmental factors on PV power generation and operation of the assets. New parameters, which include relative humidity, precipitable water, rainfall, snow days, wind speed and albedo are available as annual average maps and monthly averages. Heating and cooling degree days and solar radiation seasonality help to better understand the climate conditions of a site. In pvPlanner, the PV simulation model implemented is based on semi-empirical formulas. In the new Prospect app, we have implemented the single-diode model that allows for more accurate calculation of conversion losses at PV modules and inverters. With new model implementation, it is possible to specify more details of any PV system configuration. The redesign of PV simulation model makes it possible to implement calculation of bifacial PV modules at a later stage of software development. 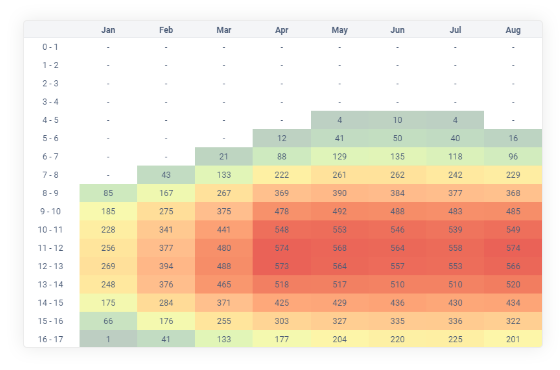 Until now, comparing the energy yield for multiple sites or technology options meant downloading multiple reports and making comparison in Excel. 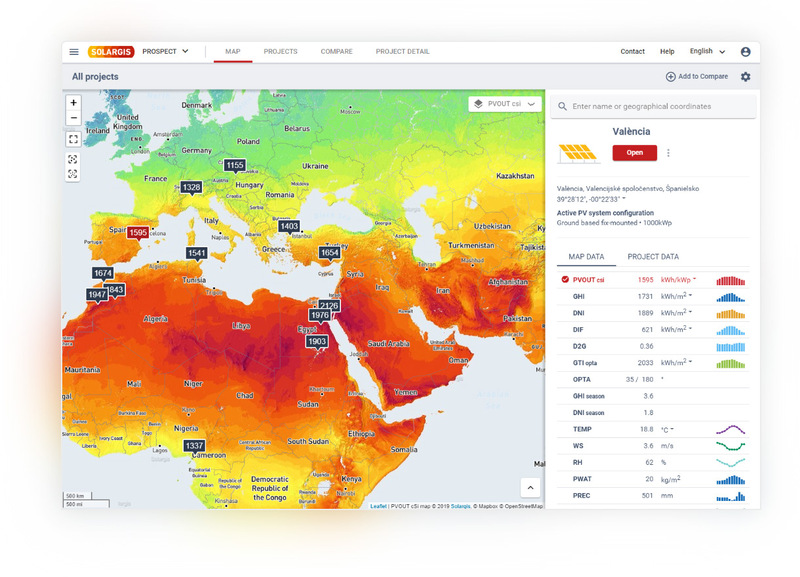 In Solargis Prospect we’ve introduced a compare tool that allows for quick comparison of solar resource, meteo, and PV potential data for different locations or PV project configurations. In iMaps and pvPlanner, the main source of elevation data is SRTM3-v2, which has inaccuracies in some islands, coastal regions, and some desert geographies. The spatial resolution of terrain data in iMaps/pvPlanner is 90m for Europe, and 250m for rest of the world. In Solargis Prospect app, we have made a big update of the terrain and horizon data. The primary data source for the updated elevation data layer is SRTM-v4.1, which is an improvement over SRTM3-v2. Some issues that were still not resolved with upgrade from SRTM3-v2 to SRTMv4.1 have been fixed by applying patches based on multiple data sources. The updated terrain data has spatial resolution of 90m globally. Besides elevation, two new terrain data layers are visible as maps: terrain slope and azimuth. Solargis Prospect supports team collaboration. Projects can be saved and shared amongst team members, making collaboration easier. Project level sharing gives better control over how data and information is created and shared within a team. It is also possible to organise projects using tags. For those who prefer other languages over English, we have good news. The Prospect app has already been translated to simplified Chinese and Spanish. Translation to several other languages is in progress. Calculation of ROI, LCOE, and IRR is now available. The Prospect app comes with an Economic calculator that allows to input capital cost, operation cost, and cost of electricity, to determine the economic feasibility of a project. The management of user and company accounts has been completely redesigned. A user can now create a company account and invite colleagues to join the company account. Each company account is managed by one or more admins who are typically the dedicated responsible persons in each company. The new company admin tool allows admins to manage all users and purchased resources associated with their company. We are also working on streamlining process of orders, payments and renewals. Professional plan, for EUR 3000/year, includes additional features relevant for teams working on larger projects, say above 1 MWp. 3. Can't wait to try the new app? Visit apps.solargis.com/prospect. Many features, such as access to annual averages are available for free to all registered users. The new Prospect app is based on your feedback. Please try it out. We would love to hear what you like and what could be done better. You can send us your feedback by commenting below. Your feedback will help us to further develop and improve the Prospect app.